Big Bend National Park is home to some of the most amazing views in Texas. I’ve had the opportunity to photograph this remote Texas landscape along the Rio Grande several times, and at the end of each visit I’m left wanting more time, more sunrises and sunsets, and another day to explore the trails and vistas offered here. The hike to the South Rim of Big Bend is often referred to as the best hike in Texas. Depending on your route or your curiosity, the round trip can often exceed 13 or more miles. While I’ve explored the Chisos Mountains and Chihuahuan Desert, I’d never visited the South Rim until recently. I’d planned to make this hike on other occasions, but poor weather made conditions to photograph the Rim not worth the effort of lugging camera equipment that far. But over the course of a four day visit to Big Bend and using a sunset-conditions predictor program, I finally found a good night to go. To shoot sunset or sunrise at the South Rim, you either have to camp or hike one direction in the dark. Lugging a camera, several lenses, a tripod, and a star-tracking mount (for Milky Way photographs) took precedence over a tent, so I was left with the only option of hiking back in the dark. So I set out about 4pm on an April afternoon layered in wispy clouds and climbed the 2,000+ vertical feet up to Laguna Meadow. The hike itself isn’t hard. The trail is easy to follow and the uphill isn’t anything daunting. It’s just a long grind with a backpack full of equipment and gatorade. By the time I reached the edge of a 1,500 cliff of the South Rim, I’d only seen hikers going north in the direction of the trailhead. With the remnant of the Chisos stretching out before me and the Rio Grande winding through the desert far below, the landscape that rewarded my efforts inspired a sense of awe and reminded me of how small we are. (I would soon be reminded of this again while shooting the night sky). Finally able to take off the backpack, I set about trying to find the optimal locations for shooting at sunset. Agave, Prickly Pear, Claret Cups, and a view into the desert all clamored for my attention, and choosing was difficult only because of so many options. Ultimately, I decided on four areas – one while the sky was still blue, one for the moment the sun hits the horizon (for the star burst), another to capture the colors of the clouds at sunset, and a last take for the Milky Way finale. When I shoot at sunset, I usually take 3, 5, or 7 exposures of the same image in order to adjust the foreground and sky accordingly. Some folks do this to create an HDR effect, but I try to bring out the colors while leaving the scene more realistic. I’ll also shoot different focus points in order to make sure the entire image is sharp and consistent. With that said, I was fortunate with the clouds and sunset, as the combination of light and color made the long hike worth it. This first image is a panorama looking west at the moment the sun fell below the horizon. A path winds along this southwest rim where you can find some amazing panoramic views – even to Santa Elena Canyon on the western edge of the park boundary. This photo is comprised of at least 12 different images, then blended and stitched together to show the true colors of sunset high on this mountain. From the southwest rim of Big Bend National Park, this panorama was taken in late spring as the sun set behind the distant mountains. 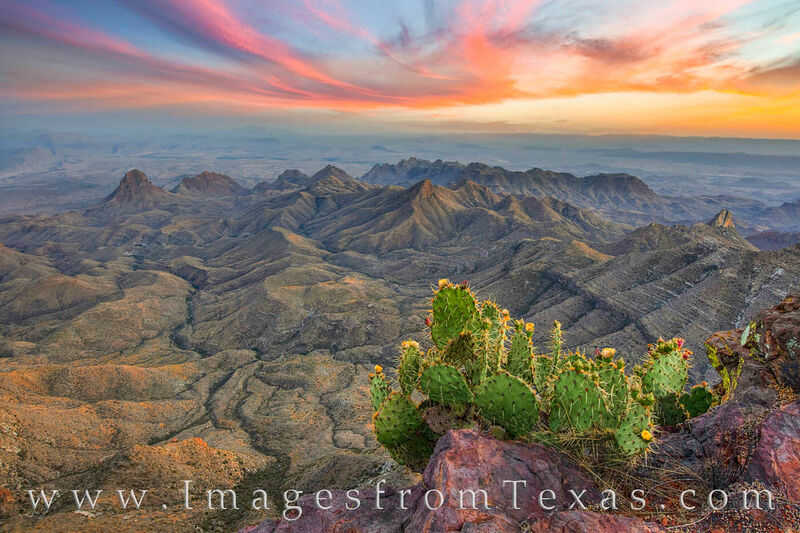 High above the Chihuahuan Desert, you’ll have this amazing view of the Texas landscape from the South Rim of the Chisos Mountains. The hike to this point is over 6 miles – often longer depending which route you choose – making the round trip 13 or more miles in most cases. But the view is well worth the effort in this remote part of the Lone Star State. This panorama can be printed in custom sizes. Please contact me for more information. The next image comes from the South rim looking south over a portion of ancient remains of the Chisos Mountains. Beyond those peaks, the Rio Grande runs east, serving as a boundary between the Lone Star State and Mexico. Taken about 15-20 minutes after true sunset, this photograph shows a cactus as it hangs onto a cliff 1,500 feet above the desert floor. The foreground was taken as a separate image, then blended with a photograph of the distant mountains to create sharpness throughout. The sky was yet another image in order to bring out the colors of a beautiful Texas sunset. After this series of photographs, I pulled out the IOptron StarTracker, a device I use to track and shoot the night sky. After aligning the machine with the north star and mounting my camera on top, I set about capturing long exposures of the Milky Way at a relatively low ISO to show points of light as sharp and crisp, just as you’d see if you were standing there. I should note the foreground of this image was taken about 30 minutes after sunset while it was nearly dark, but with still enough light to bring out the definition of the distant peaks. With the foreground and the Milky Way taken at separate times, I then blend the two together back at home and do my best to give it a realistic feel. I feel strongly that a good Milky Way image should contain a strong foreground element. It is a fine line when combining the two (foreground and night sky). I want the viewer to feel the sense of awe with the vastness of the Milky Way while also having a foreground that stabilized the scene. Having the foreground just the right brightness – not too light or to dark – is the conundrum. For these prickly pear cacti, I also used a soft light to slightly increase their illumination. It is a long hike to the South Rim of Big Bend National Park. On this trip, the round trip was over 13.5 miles. But when you stand on the edge of a thousand foot cliff and look over the ancient mountains and into northen Mexico, you are rewarded with a magnificent view. If you linger a little longer and are willing to either camp or hike back in the dark, you can enjoy one of the more amazing night skies found anywhere in the world. 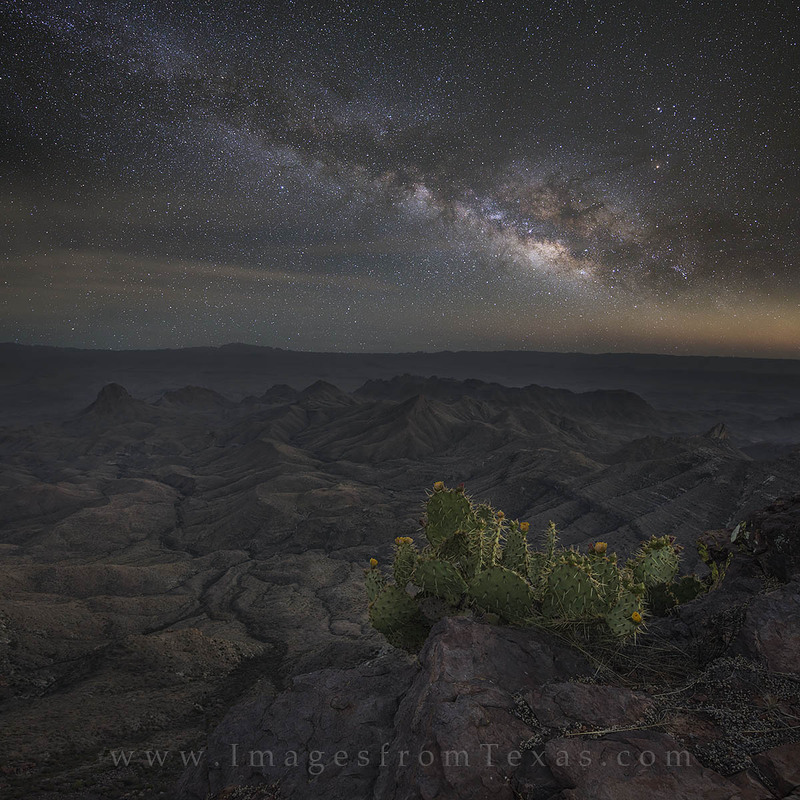 In this image, a prickly pear cactus hangs on the edge of a rocky cliff as the Milky Way begins its ascent and stroll across the sky. To the west, the inklings of sunset can still be seen glowing along the horizon. I used a small low light flashlight to slightly illuminate the prickly pear blooms in front of me. My left foot was about 6 inches from a vertical cliff while shooting this scene. Sometimes its better when you can’t see everything! This image is a square, but can be cropped and printed up to 40 inches high. When you are photographing the Milky Way at Big Bend, you are witness to one of the darkest skies in North America. The stars are truly amazing in this isolated corner of Texas and sparkle with a clarity rarely seen in other places of not only in our state, but the U.S. in general. Underneath a canopy of shimmering light, I embrace that sense of wonder at what the heavens hold and find myself full of ponderings and possibilities. But then a 7 mile trek in the dark still awaited. The walk back in the wee hours of the morning was uneventful except for the dive-bombing birds and the UFO above a distant ridge. I felt fortunate to have witnessed a beautiful sunset at such a remote and truly Texas landscape. While my time here was brief, I hope to return again one of these days. If you read this far, thanks! Posted in Big Bend National Park, Texas Landscape Images, Texas National Parks and tagged big bend images, big bend national park, hiking big bend, hiking texas, hiking the south rim, south rim hike, south rim images, texas landscapes, texas national parks, the south rim on May 14, 2016 by Rob Greebon.